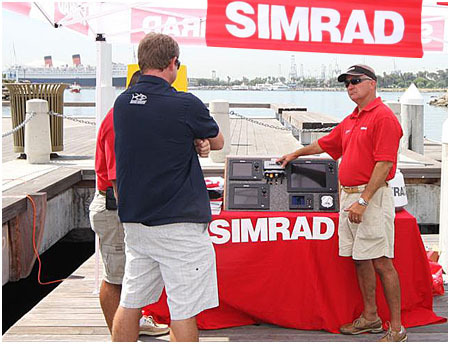 Simrad recently invited several members of the Southern California outdoor media to a demo day in Long Beach to show off their latest toys. Simrad let us test out the new line of NSS multifunction touch-screen displays and the network based accessories they control on the water, where we could really put the units through the paces. The test boat was a badass 36-foot Yellowfin center console powered by triple 300-hp Yamaha outboards. 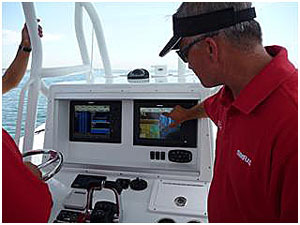 Rigged up on the helm were a 12-inch Simrad NSE (non-touch screen) and a 12-inch Simrad NSS touch-screen display. Both units were connected to a full line of Simrad network peripherals including a sounder, radar, plotter, etc. 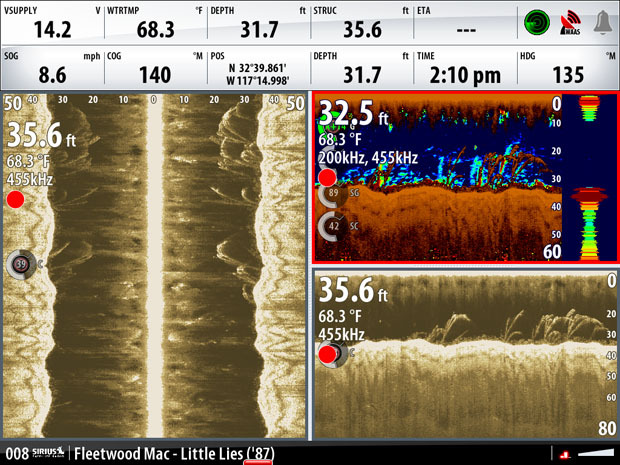 After an impressive demo of the NSS technology at the recent ICAST tackle show out in Las Vegas, we were anxious to see how it performed on the water. When we witnessed the functionality of the NSS first hand, we were very impressed to say the least. This touch-screen unit is a hybrid of sorts, combining a top-of-the-line multifunction display and the ease of use you experience when you sit down with an iPad. While this description sounds somewhat simplistic, it’s really right on the money. of the device is as easy as sliding, scrolling or tapping your way around an iPad with your finger. 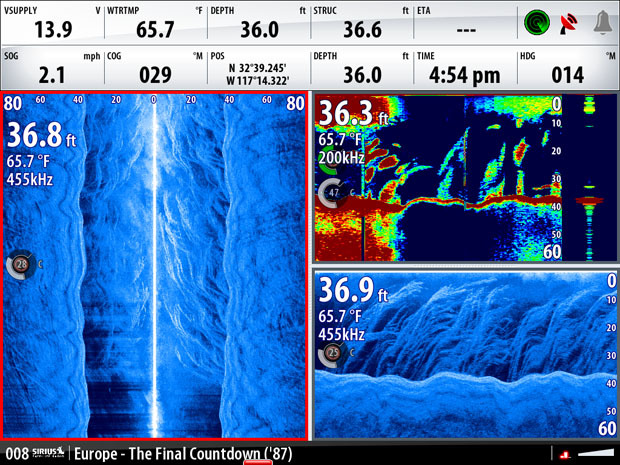 If you currently use a smart phone or tablet device, you’ll find yourself extremely comfortable navigating around the Simrad NSS. You can set up custom pages that feature the data you want, such as a sounder on one side and plotter on the other or any variation therein, by simply dragging and dropping the screens you wish to display on a blank page. Configuring data boxes is equally as easy — just press and hold the box you want to change and select the new data you’d like displayed from a drop-down list. These features are just the tip of the iceberg. The NSS is capable of many different tasks, but every aspect of configuration and operation is equally intuitive and simple. Gordon Sprouse of Simrad Yachting shows how easy it is to customize the display of the NSS Sport touchscreen. Gordon Sprouse of Simrad Yachting shows how we’ve taken touch screen technology to a whole new level. With all that said, a great display is nothing without solid input from the other network devices. During our demo we got the opportunity to see several of Simrad’s other new units at work, namely the Broadband 3G radar, BSM-2 sounder and StructureScan sonar. Each of these units offered up top-tier performance in their respective categories, but the StructureScan system really stood out. StructureScan uses a single thru-hull transducer located in the V of the hull to project and receive sonar waves below and to the sides of the vessel. The images displayed by Structure Scan have a level of clarity and resolution that is so good, it’s hard to believe. You can make out submerged objects, pods of bait and just about anything off to the sides of the boat, as well as underneath the hull. While this technology has been available in the freshwater market for a couple of years, this is the first system up to the task for salt water. As we motored down the Long Beach break wall, we could clearly see baitfish, rocks, fish and strands of kelp on the display. The image almost looks like a monochromatic photograph. If you see something of interest, you simply press and hold it on the screen and a waypoint to that exact object is entered into the GPS. You are even given the option of having the autopilot steer you back to that point of interest. You can’t help but imagine the applications for offshore fishermen when looking underneath kelp paddies or schools of bait. By now you are probably wondering what does this new bleeding edge technology cost? We wondered the exact same thing and were pleasantly surprised. The NSS line of products is offered at prices that are inline with similar offerings from Raymarine and Furuno. Simrad has clearly taken the first leap in a new era of marine electronics. You can rest assured their competitors are not far behind. Currently Furuno, Garmin and Raymarine are working on next-generation touch products that will ship before the end of the year. All of this is great news for consumers. You can expect to see more selection and lower price points in the near future. For more information, visit www.simrad-yachting.com. The NSS Sport multifunction display makes it easy to work with multiple windows – Gordon Sprouse of Simrad Yachting explains how.